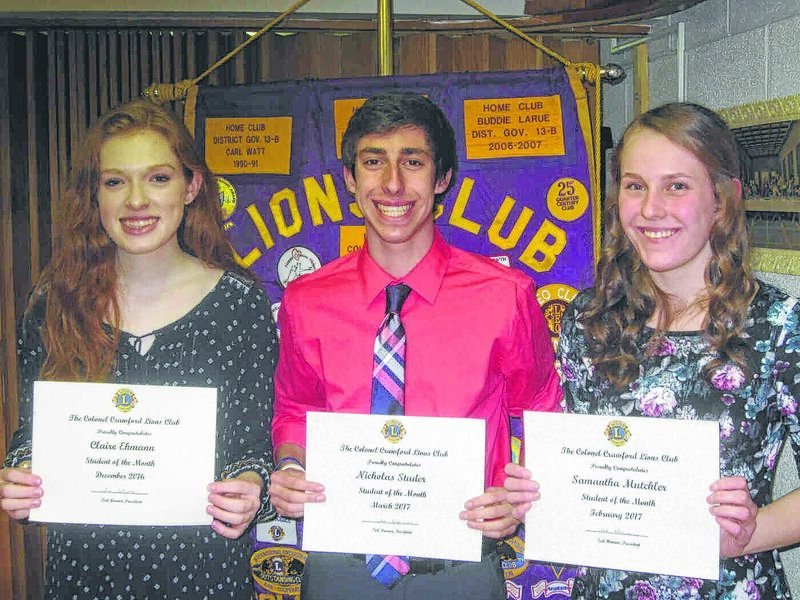 NORTH ROBINSON — Three Colonel Crawford Students of the Month were honored at the March dinner meeting of the Colonel Crawford Lions. Each student received a commemorative certificate and a check for fifty dollars. Family members of the Students were also guests at the dinner meeting. The December (2016) Student of the Month is Claire Ehmann, daughter of J.C. and Marilyn Ehmann. She is a member of National Honor Society, Student Council, and Academic Challenge. Claire serves as Senior Class vice-president. Miss Ehmann’s sports team participation includes basketball, track, volleyball and Club volleyball. She is a member of FCCLA, Art Club, Young Life, and is LEO Club treasurer. Other school activities include being on the yearbook staff and serving as a teacher’s aide. Claire plans to attend OSU Mansfield to major in English, planning to become a librarian. Samantha Mutchler is the February Student of the Month and is the daughter of Brett and Kim Mutchler. She serves as vice-president of the National Honor Society and has earned an academic letter each year of high school. Mutchler participates in track and has earned several volleyball awards as well. She is the LEO Club secretary, a member of FCCLA and Art Club. Some of her service activities include helping at the Fall Festival, the Lions Club Spook Alley, and the Col. Crawford Academic Boosters Dinner Theater. Miss Mutchler is a member of Good Hope Lutheran Church in Bucyrus. She would like to major in interior design, with a business minor, but has yet to choose a college. Chosen as the March Student of the Month is Nicholas Studer, son of Andy and Melanie Studer. He is a member of National Honor Society and Student Council. Mr. Studer serves as senior leader in Young Life, is on the School Leadership Committee, is president of FCCLA, and a LEO Club member. He led the 2016 Prayer-at-the-Pole gathering, and was a 2016 Buckeye Boys State Delegate. Studer runs on both Cross Country and Track teams. He also manages the Little League Baseball concession stand, and is a member of Youth Group at Crossroads Community Church in Mansfield. Nicholas plans to attend Ohio State University in the fall, but his major is undecided.